We beseech thee, O Lord, to pour thy grace on all who go to other lands, publishing the word of salvation: That, following the patient labours of thy servant Anskar, who carried the message of thy Gospel beyond the sea, they may gather many believers into the fold of thy holy church; through the merits of our Lord and Saviour Jesus Christ. Amen. Almighty and Everlasting God, who didst send thy servant Anskar as an apostle to the people of Scandinavia, and didst enable him to lay a firm foundation for their conversion, though he did not see the results of his labours: Keep thy Church from discouragement in the day of small things, knowing that when thou hast begun a good work thou wilt bring it to a fruitful conclusion; through Jesus Christ our Lord, who liveth and reigneth with thee and the Holy Spirit, one God, for ever and ever. Amen. 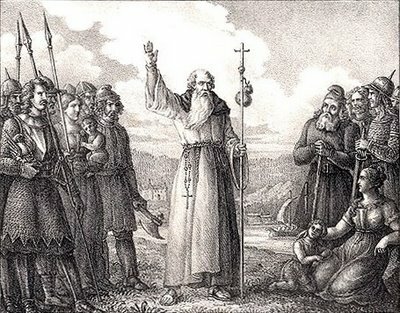 O God, who willest that all men should be saved, and come to the knowledge of the truth: Send forth, we pray thee, labourers into thy harvest that, following the example o thy blessed Saint Anskar, they may preach the Word with boldness and gather many believers into the fold of thy holy Church; through Jesus Christ our Lord. Amen.